This online study, conducted by an independent service, polled 1,054 U.S. consumers of ages 18 years and older. 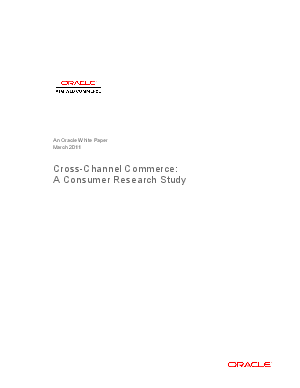 It analyzed their use of channels-including computers, mobile devices, bricks-and-mortar stores, catalogs, and customer service representatives-to gain more information about or to complete the purchase of a product or service. The survey also gathered data about consumers' experiences with these channels, as well as their attitudes toward e-mail marketing promotions and the incorporation of social media into their online commerce activities.